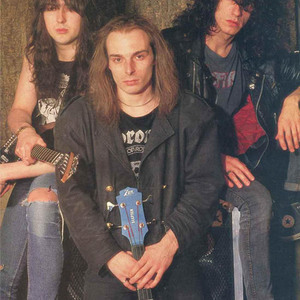 Coroner is a Swiss technical thrash metal band from Zurich, Switzerland formed in 1983. They garnered relatively little attention outside of Europe. Coroner's music combines elements of thrash, progressive rock, jazz, and industrial metal with suitably gruff vocals. With their increasingly complex style of progressive rock-infused thrash, they are often labeled as "the Rush of thrash metal" by music critics. Coroner's sound then progressed and the production became more refined, resulting in the more progressive No More Color, Mental Vortex and Grin albums. The Swiss thrash trio Coroner were originally road crew for Celtic Frost. They eventually formed their own group, recording their demo Death Cult in 1986 with Tom G. Warrior of Celtic Frost on vocals. Their first full-length album R.I.P., released in 1987, featured bass player Ron Broder on vocals and he assumed the role for the rest of the group's existence. The group released several albums through to 1993, ending with a greatest hits collection, Coroner, in 1995. Lack of media exposure brought this band to disbanding in 1995 ? and to their farewell tour consequent to their self-titled album in January and February 1996. In March 2005, talks of a reunion were in the works, but later retracted. The main reason was that neither Marky, Ron, nor Tommy had the time it would require to do this properly, and also that none of them liked to, quote, "reheat things, except spaghetti sauce." However, in June 2010, Coroner eventually decided to reunite and play at the Hellfest Summer Open Air 2011 edition. Asked if the band were planning to write a new album, guitarist Tommy Vetterli replied, "you know, making a new album is kind of difficult... (Pause) Well, you never know. Maybe after four or five shows we'll get into it and say, 'Hey! Let's do an album!' Nobody knows what's going to happen. We don't have a master plan". Musically, Coroner evolved from a speed metal band with gothic and classical overtones like Celtic Frost and Bathory into a technical-based band. Coroner's first album, R.I.P., was based on neo-classical lines and was technical and classically influenced. The second album, Punishment for Decadence, saw a progression into a more complex sound with a unison of bass and guitar. Tempo changes interspersed mid-paced sections and the odd slow passage between the faster passages started to emerge. Lyrically, Coroner began to write about themes such as politics and personal introspection. No More Color was produced by Pete Hinton and the band. Coroner's music became more technical on No More Color as the guitar work was characterized by intricate modes and arpeggios, solo work that was chromatically colorful, as well as the de rigueur crunchy chords and speed runs; the drumming went beyond the 4/4 time of Coroner's two previous albums to incorporate odd time signatures which became their trademark. Ron Royce's bass playing is also worth a mention as having an advanced three-finger technique which enables him to double the rhythm line as well as perform more intricate riffs. Prime examples of this are the opener "Die By My Hand" with its vicious riffing and the harmonic minor inspired riff in the middle of "Mistress of Deception". There is an altogether dark mood on this album that could be classified as death metal yet spans many influences from other metal genres. The closer "Last Entertainment" is a prescient take on TV. Mental Vortex continued the evolution over No More Color. Continuing with the previous album's technical formula, the speed metal formula was re-integrated into Coroner's sound on this album but with a tone that made it sound not at all like R.I.P. or Punishment for Decadence. There were slower songs but none of the songs on Mental Vortex stayed the same speed for very long. The songs on Mental Vortex ranged from four to eight minutes. Overall, the tone was a shift from the thrash/technical of No More Color which showed them gravitating towards their opus Grin. Grin saw a much more industrial sound and was a natural progression from Mental Vortex but was different from most of their previous material. It involved a much more reflective guitar riff and underlying bass line. It was slower and more refined in its metal sensibility. Brooding guitar over Royce's bass produced an almost hypnotic trance-like sound on some tracks. Their eponymous album, Coroner, was a compilation which contained unreleased material and a selection of hits from previous albums. The band appears on Br?tal Legend with the song "Skeleton On Your Shoulder".